Mucous Cyst Handout | Dr. Thomas Trumble, M.D. A mucous cyst is a small cyst that occurs at the joint next to the fingernail: the distal interphalangeal joint (DIP). Although the mucous cyst is often painless, arthritis can be associated with the cyst, resulting in joint pain. 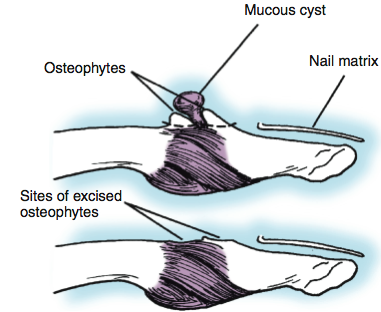 As the cyst enlarges, it can deform the nail causing a longitudinal groove. If the cyst ruptures, it can become infected. The cyst arises from an area of bone spurs at the level of the DIP joint. This causes the cyst to form with a stalk that traces all the way into the joint (Figure 1). These often occur in individuals 50-70 years of age. Women are more common than men because of the predominance of arthritis. How do we diagnose a Mucous Cyst? The cyst is generally diagnosed clinically, although x-rays help to confirm the location of the osteophytes or bone spurs. (Please see figure above). How do we treat Mucous Cyst? The cysts tend to recur after they have been aspirated with the needle (having fluid drawn out of the cyst with a needle). 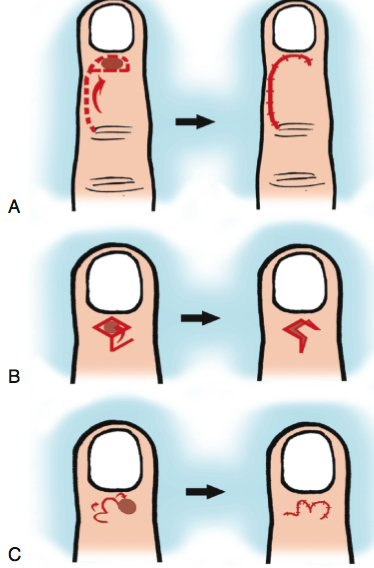 Once the cyst begins to cause problems with the deformity of the nail, it is recommended to excise them. The incision must be carefully planned in order to allow for skin coverage when the cyst has caused the thinning or damaging of the skin (Figure 2). We often recommend placing a small pin across the joint (if the tendons have been stretched out by the cyst to prevent the finger from drooping into flexion). The pin can be removed at two weeks when the sutures are removed. The patients are seen by a physical therapist two to three days after surgery, so that the bulky dressing can be removed and replaced with a smaller plastic or Orthoplast splint. This protects the finger from being bumped or injured. At two weeks, the sutures are removed and a protected splint can be refashioned to accommodate for swelling. Early range of motion is allowed and the patients can return to all activities once the sutures and the pin have been removed. The patients usually recover back to their preoperative motion one month after the surgery. The scars can be sensitive for several weeks after the surgery. A therapy program with a scar massage, an exercise program, and a night splint are helpful.